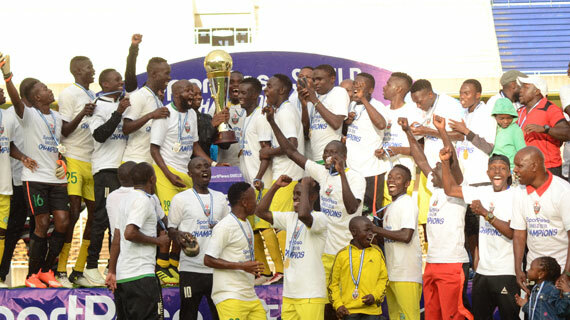 Kariobangi Sharks wrapped up their first ever major title on Saturday evening, beating three-time champions Sofapaka 3-2 to clinch the Football Kenya Federation (FKF) Shield title in a dramatic final at Kasarani. Sharks who reached last year’s final and lost to AFC Leopards were trailing 2-1 with 10 minutes to go after letting off an early lead, but Sidney Lokale and George Abege scored with eight minutes to go while Sofapaka’s Kevin Kimani missed a penalty immediately after Abege’s goal. Sharks had a brilliant start to the game and threatened severally with Harrison Mwendwa hitting the side netting in the fourth minute after beating keeper Wycliffe Kasaya to the ball in the fourth minute. They kept searching for the goal and Henry Juma had a chance when he was picked out by Duke Abuya but his volley from the right went over. Twice from Harrison Mwendwa cutbacks, Sharks came close but in both occasions Juma and Shaphan Oyugi hit shots over the bar. The pressure bore fruit after 29 minutes when Abege beat the offside trap to race to a Patillah Omotto through pass before shooting low past keeper Kasaya. Sofapaka put in the hard yards of work to try and get back into the game and were awarded a minute to the halftime whistle when skipper Waruru brushed a header past keeper Gad Mathews at his near post off a Kimani freekick. In the second half Batoto ba Mungu started by making attacking changes, Ezekiel Okare coming on for Kepha Aswani. They were clearly coming into the final half on the front foot and they were awarded on the hour mark when Kimani headed them ahead. Kassumba did well with some exquisite piece of skill on the right to get away from his markers and lay in a cross which was met by the pint-sized midfielder at the backpost, heading it in from a tight angle. Three minutes later, Kassumba had a chance to get a goal for himself when he was flicked on by Okare, but his volley on the first time of asking went over. Sharks made changes with Sidney Lokale coming on for Juma while Shaphan Oyugi was rested for Vincent Wasambo. Baraza made another change bringing on Teddy Osok for Elli Asieche in midfield as he sought to have more solidity. In the 70th minute, substitute Lokale had a brilliant opportunity to take Sharks back into the game off a swiftly executed counter but his eventual shot from inside the box went wide. But they never gave up and kept surging. They went level in the 82nd minute when Lokale turned the ball home from inside the six yard box from a Duke Abuya cross. They scored what would be the winner three minutes later when Abege took advantage of some indecision from keeper Kasaya to head home. Kimani was brought down inside the box on the restart and referee Israel Mpaima pointed to the spot, but the midfielder hit his effort over the bar, huge heartbreak for Batoto ba Mungu.